Scene75 Entertainment Center’s Dayton location has been selected as one of three finalists for the “Top FEC of the World: North America” by IAAPA. The Dayton original, Scene75 Entertainment Center, may be at it again... 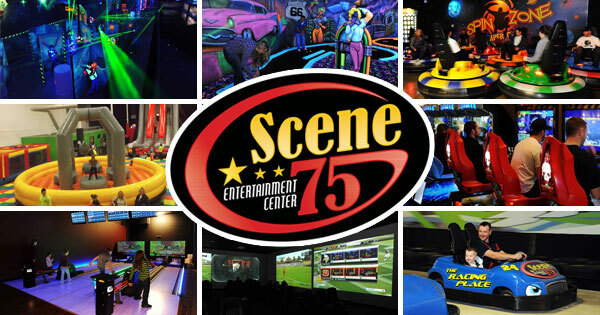 The International Association of Amusement Parks & Attractions (IAAPA) has just named Scene75 Entertainment Center (Dayton) as one of three finalists for the “2015 Top Family Entertainment Center (FEC) of the World: North America”. The overall winner will be announced as part of the Brass Ring Awards Ceremony at the IAAPA Attractions Expo in Orlando, Florida on November 18th, 2015. IAAPA is the largest association of amusement facilities worldwide, with member facilities including: family entertainment centers, amusement parks, theme parks, water parks, zoos, aquariums, museums, and science centers. IAAPA’s Brass Ring Award for the North American Top FEC of the World is an annual award that recognizes the best family entertainment center and has numerous entries each year from all across North America. Scene75 estimates that there are well over 5,000 family entertainment centers throughout the United States, Canada, and Mexico. The overall winner of the award is judged based on a visit performed by a professional mystery shopper, the value that a facility adds to its community, and an application PowerPoint presentation. A panel of seven judges, including two past Top FEC winners, evaluated the application PowerPoint and Scene75’s community programs, initiatives, and events. An amusement industry mystery shopper evaluated Scene75’s performance from the customer’s perspective in the areas of a pre-visit telephone call, web site review, general appearance, staff hospitality, cleanliness, landscaping, attractions, food quality, state of repair, safety, service received, pricing, and more. It was through this judging that Scene75’s Dayton location was selected as one of three finalists for the best FEC in North America. Scene75 is extremely excited to be competing with the two other outstanding finalists, “HeyDay” in Oklahoma and “GameTime - Miami” in Florida, for the overall Top FEC in North America. Teresa Sakosky, VP of Operations for Scene75 Dayton, had this to say, “Its an honor to be nominated for one of the most prestigious awards; if not the most prestigious award in the amusement & attractions industry. I am very proud of the entire Scene75 team, and it is rewarding to know that our peers in the industry are recognizing our hard work. Our team at Scene75 could not be more excited, and we look forward to the announcement of the overall winner at the IAAPA Attractions Expo in November”. Scene75 would not be in a position to win this award if it wasn’t for all of the support that it has received from the Dayton area since it first opened its doors in July 2012. Jonah Sandler, Scene75’s Chief Entertainment Officer, often says, “It takes a community to build Scene75, but it takes another one to support it”. Therefore, being a finalist for this award is not only an achievement for Scene75, but also an honor that can be a source of pride for everyone in the Dayton community. Bar & Grill – Scene75 features a full service restaurant with delicious food such as appetizers, burgers, pizza & more. There are also two bar locations inside the facility with beer, wine, and cocktail options for the adult guests. Congratulations to Scene75 and good luck bringing home another trophy!